The presence of Iberico ham in pantries, kitchens and restaurants throughout the peninsula comes as no surprise. This flagship of Spanish cuisine has become one of the preferred snacks, lunches or foods for big celebrations or intimate family dinners, but do we know all about it? 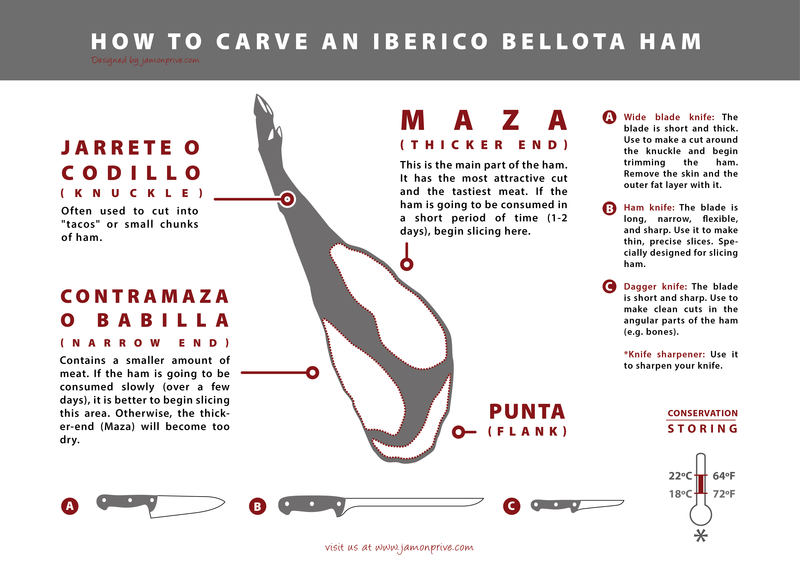 Here are some curiosities of Iberico ham. We are used to see how the modern world likes to invent new products disguised as tradition. But Iberico ham is far from that. This is demonstrated, for example, by the fossilized ham that was found in an archaeological site of ancient Tarraco (Tarragona); Iberico ham is the gastronomic legacy of more than two millennia. If this is not enough, we can review stories and recipes, finding that Iberico ham is mentioned in texts from the second century BC and appears in documents written by characters such as as Pliny the Elder, Columela or Cato. One indisputable fact is clear: the ancient inhabitants of the Iberian Peninsula were experts in breeding pigs and the ham they produced was highly valued throughout the Empire. Further confirmation of this fact is the prestige of pork butchers. In the early years of pork production, slaughter men and butchers were usually slaves, and were usually also the cook. Gradually pork producers rose in the social scale, and during medieval times, this figure was becoming increasingly important as character sought and respected by all. Another curiosity of Iberico ham. Have you ever wondered why ham is hung? In bars and restaurants as well as in specialty stores, you’ll find Spanish hams and other meats, hanging from hooks in the ceiling. How come? According to some historical sources, during the sixteenth and seventeenth centuries this practice began among local small Christian producers. Hanging hams in the entrance to their shops became a way of saying "I am a Christian" as a kind of flag to differentiate themselves from Muslims and Jews and thus avoid trouble with the authorities at the time. But let's be pragmatic. It’s not difficult to imagine a producer of Spanish ham with experience and observation who realizes that if the ham is supported on a surface during the drying and maturing process, the result is not entirely satisfactory. More mold, less perspiration … if only there was a better way. 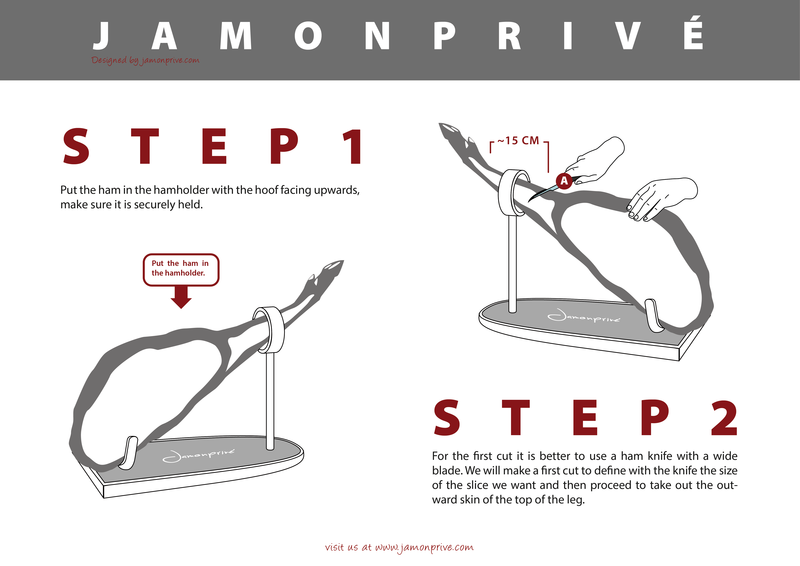 This is the best explanation: the hams are hung for adequate ventilation and, with the help of gravity, to remove excess moisture and fat. Have you ever seen those little plastic hats placed just below a hanging ham? That’s where all the moisture seeping from the Spanish ham is collected. What could be more Spanish than ham tapas? What is the relationship between the two? Oddly, Spanish ham has much to do with the origin of the term "tapas" which has become today throughout the world for a culinary concept inherent to Spanish gastronomy. The etymology of this word sends us back to the Middle Ages and the reign of Alfonso X. When the King was undergoing a period of convalescence his doctor told him to drink wine, but to add a covering or hat - "tapa" in Spanish - to ameliorate its intoxicating effects with a small portion of food. This idea, that to avoid getting drunk alcohol should be accompanied by some food, was spreading and becoming increasingly popular among ordinary people. This is demonstrated by the law enacted by the Catholic Kings, by which the bartenders were forced to serve some cold cuts and bread to reduce the effect of wine and beer. Shortly before this, a remarkable episode occurs. According to the story, King Fernando VII stopped at a tavern in Cádiz where he was served a glass of sherry. The strong wind characteristic of the area had raised up a storm of sand from the local beaches, and the King asked for a wine glass - covered, for protection, with a slice of ham. He ate and then ordered another, and another. This practice was spreading slowly, and in subsequent years, it became the norm that every glass of wine would be served with a "cap" of ham. This is just one among many curiosities of Iberico ham found in our history.